In August, 2018, a stone production line designed and supplied by Luoyang Dahua had been put into operation at hydropower station in Pakistan. 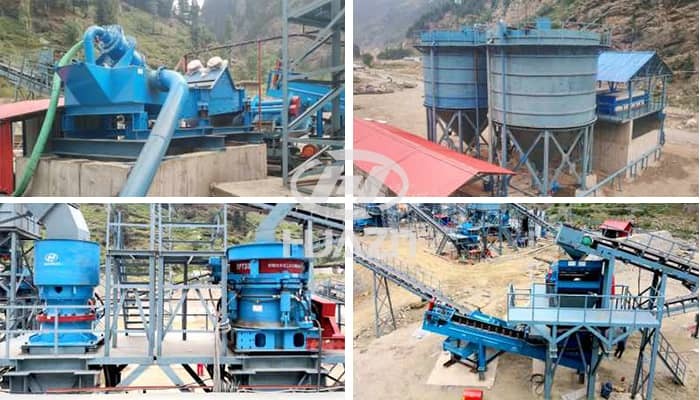 The production capacity of this production line is 90t/h, which consists jaw crusher, single-cylinder cone crusher, multi-cylinder cone crusher, sand making machine, electrical control system and sewage treatment system. The sewage treatment system is independently developed and designed by our company, which adopts the new processing technology of "fine sand recovery device + deep cone concentrator mold + chamber pressure filter". It mainly includes sand recovery machine, catchment tank, wastewater lifting pump station, efficient deep cone thickener, mechanical dehydration workshop, clear water tank, water pressurizing pump station, and dosing room, etc., with total water treatment amount of 120m³/h and mud amount of 6.93t/h. Next Article: What is Crushing Machine?